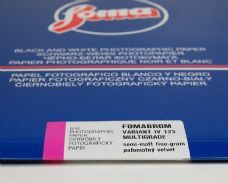 Fomabrom 123 is a Semi-Matte or "Velvet" finish with a slight degree of surface reflectance. Some call it a "stipple" surface. 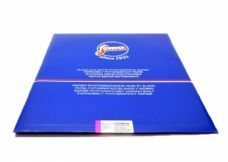 This surface is not offered by any other manufacturer (Kentmere used to offer the "finegrain" surface, which was very similar, if not identical) and was a popular type of finish in the 1960's. 123 is also popular with lith printing. 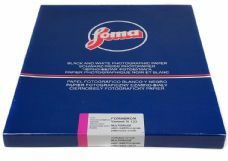 Update - Nov 2017: Foma have now discontinued this paper so as our stocks in various sizes run out we'll be removing the Add To Cart button for each page.